SAN FRANCISCO — George Takei will be a special guest at Creation Entertainment’s official Star Trek Convention, to be held Friday to Sunday, Nov. 16-18, at the Westin St. Francis Hotel, 335 Powell St., San Francisco. Takei, who in real life was born in Los Angeles, is scheduled to appear on Sunday at 1:30 p.m. 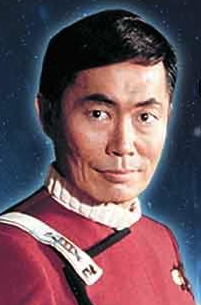 He played Sulu on the original series (1966-69) and in six movies, including “Star Trek IV: The Voyage Home” (1986), which was filmed in San Francisco. Other featured cast members are Takei’s co-star Walter Koenig (Chekov of classic “Star Trek”); original series guest stars Bobby Clark (“Arena”), Celeste Yarnell (“The Apple”) and Barbara Luna (“Mirror, Mirror”); marking the 25th anniversary of “Star Trek: The Next Generation,” series regulars Brent Spiner (Data), LeVar Burton (Geordi LaForge), Michael Dorn (Worf), Marina Sirtis (Deanna Troi), John de Lancie (Q) and Denise Crosby (Tasha Yar) and guest stars Hallie Todd (“The Offspring”) and Michael Aron (“Time’s Arrow”); Alexander Enberg (Vorik on “Voyager” and guest star on TNG), Marc Alaimo (Gul Dukat on “Deep Space Nine” and guest star on TNG), and Jeffrey Combs (Weyoun and Brunt on “Deep Space Nine” and Shran on “Enterprise”). For full schedule and ticket information, visit www.creationent.com/cal/st_sanfrancisco.html#sch.